LG Hausys, a housing material manufacturer, said Tuesday that its Hidden Display Handle won an innovation award at the Consumer Electronics Show 2019, in a first for the housing material industry. The Hidden Display Handle features internet of things technology. Its built-in display shows information on the weather, fine dust concentration levels, as well as air quality. The design has a graphical user interface that hides the liquid-crystal display. 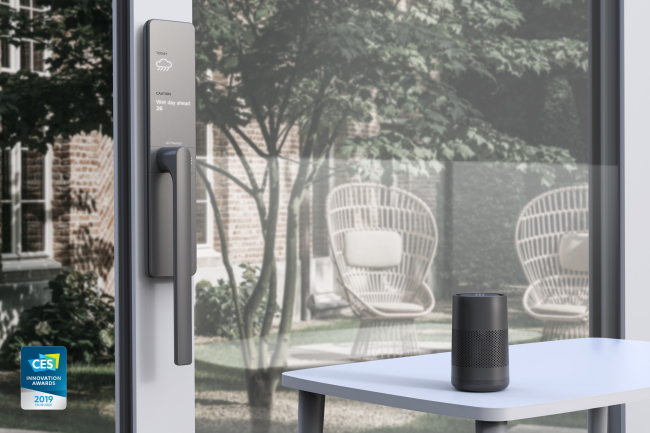 The IoT window handle also displays messages when the space needs ventilation, by detecting and analyzing the air quality indoors. It compiles data on a user’s ventilation habits and analyzes them to suggest the operation of an air conditioner or a purifier, the company said. Displaying such information on the handle helps prevent damage to health and property caused by indoor and outdoor pollution as well as weather conditions such as rain and snow, according to the company. During his or her absence, the user can also check whether windows are open or closed via a mobile application, it added. “The Hidden Display Handle is an example that clearly shows that IoT technology is expanding to the living space and being actively adopted in the construction material market. We will continue to make advanced, innovative products that can change consumers’ lives,” said Lee Min-hee, vice president at the LG Hausys R&D Institute.